Magento is known for being a feature-rich and scalable platform. 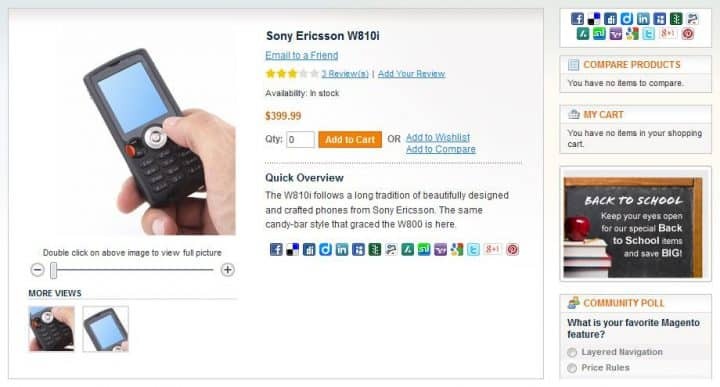 But when it comes to social e-commerce and marketing, Magento can’t offer excessive functionality out of the box. Nevertheless, there are tons of extensions to help you with Magento social media integration. 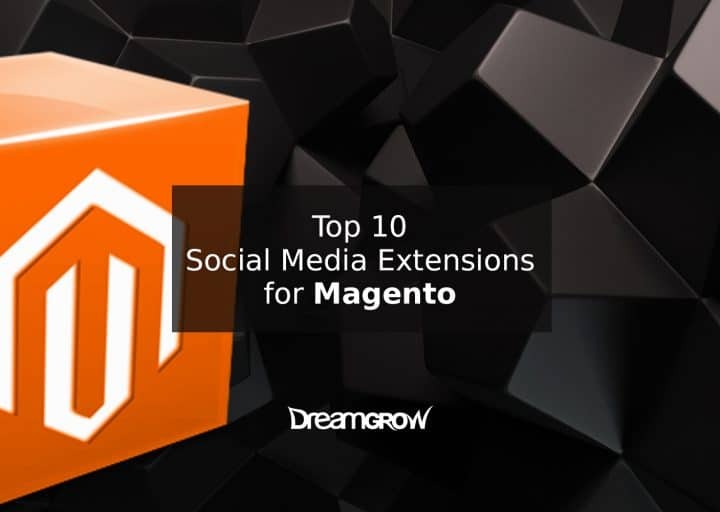 In this post, we give you a list of ten best Magento social media extensions for various purposes. Why should you bother to allow users to sign in with social media accounts? There are so many reasons, but the main one is that social login boosts conversion rate. 86% of users say they are bothered by having to create new accounts on websites. Are you surprised? I hope you are not. We live in a fast world where every second counts and having to fill several fields of information may scare your customers off. Another problem is that users may forget the actual credentials they used. According to Blue Research, 92% of users will leave a site instead of resetting or recovering login information. Using social login will minimize this issue as well. Thirdly, by 2020 50% of the American workforce will consist of millennials. 94% of 18-24 year olds and 95% of 25-34 year olds have used social accounts to log into a website or a mobile application. I’m pretty sure that no one wants to lose millennials as potential buyers. This Magento social media plugin combines both social login and social shares features. It allows users to sign-in to your website using accounts from more than 30 social networks. Social Login from MiniOrange is optimized for all devices. It allows adding icons to the login page, registration page, comments section or anywhere you want. You can also set redirection option after login or logout to point users to the page you want. This extension received 5 stars from Magento users. What else do you need to know? It supports up to 18 social accounts, is fully responsive, easy to set up and 100% open-source. 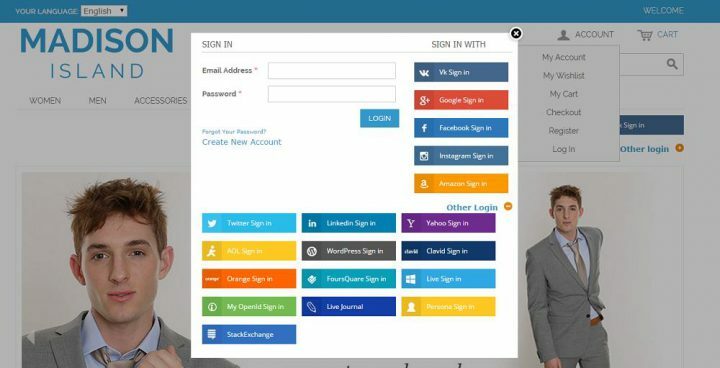 You can also change the order of social login buttons in front-end and place the social login bar in different positions. It’s not free of charge, but for $99 you receive free updates and 1-year support (Magestore is famous for its excellent support). We are social beings and we love sharing staff with others. According to Statista, 46% of responders frequently share online content. While 70% of US internet users shared content via the social network at least once. Considering the amount of content shared every day, businesses should work on allowing users to share content with ease. For Magento social media share buttons are simple to install and use. Sociable was developed by aheadWorks, one of the leading providers of Magento extensions. It offers 17 pre-installed social networks including Pinterest, Twitter, Facebook, Google+, LinkedIn, and Digg. Though it’s not as many as offered by AddThis, it’s definitely enough for the majority of Magento stores. Sociable has 8 predefined positions encompassing several variations of share buttons placement. It also provides analytics about the number of shares and type of products. This data can help you improve marketing strategy to drive more sales. AddThis is one of the most renowned sharing, following, and audience targeting tools. It allows users to share content to 220+ social networks. While the majority of users know less than 10 social networks, their dedication is worth admiration. You can also sign up for a free AddThis account to see detailed analytics. AddThis shows which services people use for sharing, which content they are sharing the most and other useful data. All analytics is available in real-time mode. As I already mentioned above, users love communicating and hate filling registration forms. That’s why allowing customers to use social accounts to leave comments and reviews are great ways to increase engagement. Besides, customer reviews can boost your conversion rate. According to Dimensional Research, 88% of customers read reviews when making a buying decision. Also, there is no need to worry about negative reviews as 68% of users trust reviews more if they see both good and bad reviews. While 30% suspect fake reviews when they don’t see any negative reviews. 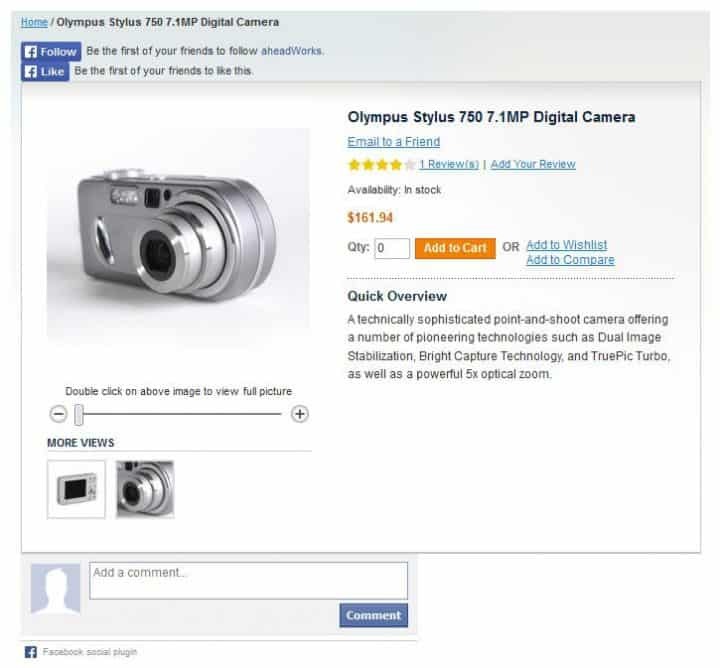 Another Magento social media plugin from aheadWorks combines Facebook login, like, follow and commenting functionality. This extension is a great way to allow users leave comments and reviews using Facebook accounts. This extension allows users to post comments and reviews using Facebook account. Also, customers’ reviews are posted directly on your Facebook page. Facebook Reviews lets you change the number of reviews shown and whether to display them in chronological order or not. You can also change the general look of reviews block by modifying CSS. Social networks are among the most efficient marketing channels. The share of marketing budgets spent on social media is expected to grow from 11% to 24% by 2020. If you are not using social networks for marketing purposes yet, it’s high time you start doing that. This extension allows you to boost the audience size by offering discounts for joining your company in social networks. 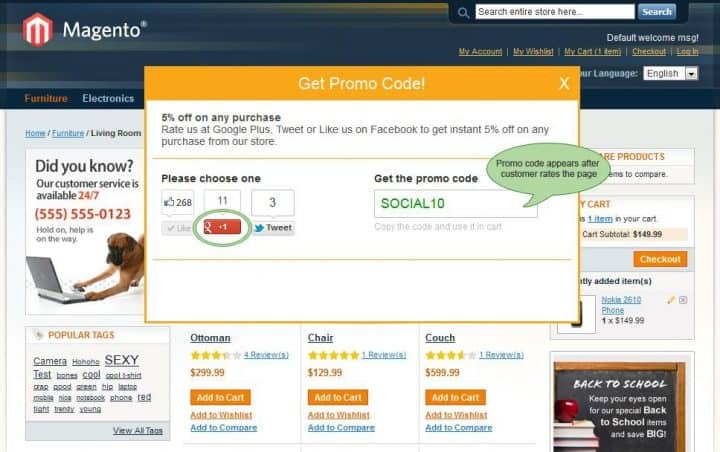 Facebook & Twitter Promo allows you to use the same coupon each time or generate a unique coupon code for each user. It also provides banners you can display on any page (or all of them) to advertise the discount. You can use your own text and images and enable or disable any of the banners. Have you ever wondered how to turn your customers into active promoters or even brand advocates? That’s exactly what Social Rebate offers. During the checkout process, consumers get the option to earn a percentage on money spent back. All they need to do is to share your message in social networks. Besides, Social Rebate offers a risk-free rate meaning that the software is free of charge and you only pay for the result. Social Rebate charges 15% of claimed promotions. For example, if you paid your customers $100 in rebates, Social Rebate fee will be $15. What if you could easily import yourMagento store to social network and start selling using social accounts? That’s actually possible thanks to various Magento extensions. Average user spends 1 hour and 49 minutes per day in social networks, so why not take advantage of it? Facebook Store application automatically imports your Magento store to Facebook with one click. Moreover, you don’t need to have any coding or design skills. Facebook Store is available in all currencies and can be customized to reflect your brand’s identity fully. 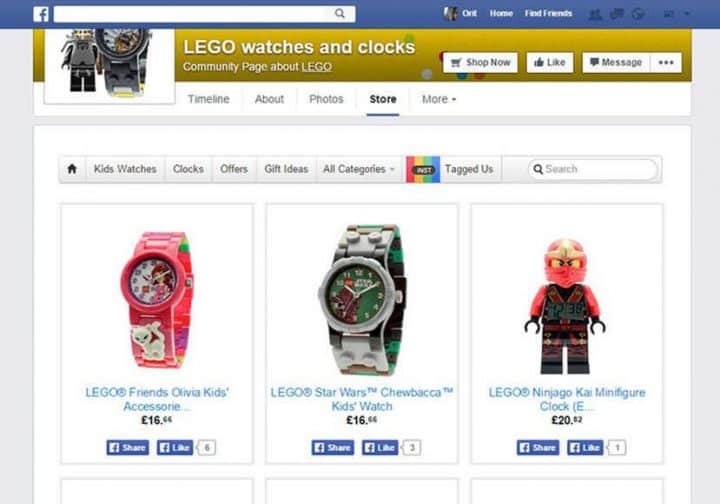 Besides, you can customize your Facebook store to any language. This extension provides in-depth statistics, so calculating ROI and performance won’t be a problem. 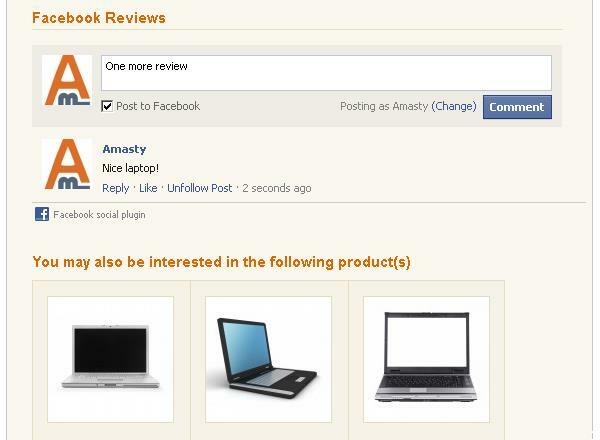 Beetailer is another great extension that integrates Magento store with Facebook (400+ reviews cannot lie). It offers the same set of features as the previous extension on the list with some marketing tools on top of it. Beetailer lets you create and automate promotions. 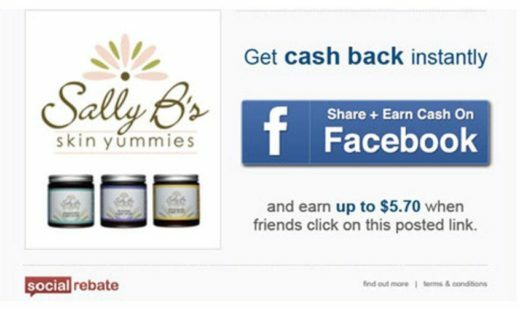 You can also create opportunities for users to become a fan or share purchases using Facebook or Twitter. And access detailed analytics with historical information about your customers’ preferences and behavior. Real-time analytics is also available. Undoubtedly, there are way more Magento social extensions to enhance shopping experience. So if you have favorite social extensions or have experience with the ones from our list, share your thoughts in comments section below. 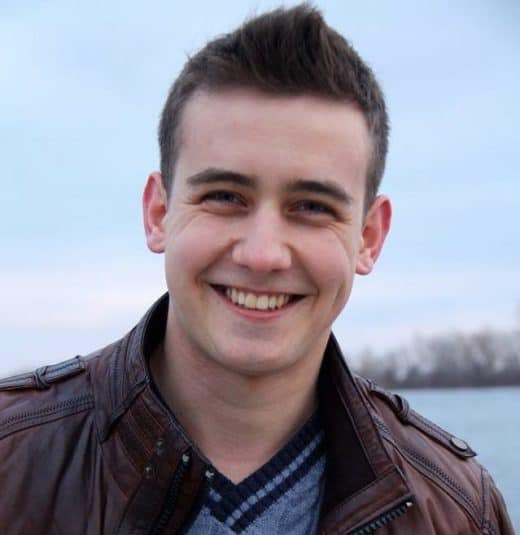 BIO: Oleg Yemchuk is the marketing manager at Maven sharing office space with online business experts and software developers. Oleg is marketing expert by day and geek by night. As a geek culture fan, he spends his free time playing video games and reading comics.